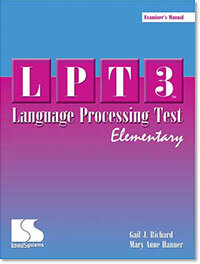 The Language Processing Test 3 Elementary (LPT 3) evaluates the ability to attach increasingly more meaning to information received and to then formulate an expressive response. It can be used to diagnose language processing disorders in underachieving children. The skills evaluated begin with simple tasks and progressively increase the language processing demand placed upon the student. This hierarchical approach ensures evaluation of prerequisite skills for increased processing demand. There are two pretests and six subtests. Each subsequent subtest builds on the skills previously evaluated. Pretest 1: Labeling - Name pictures with a one-word response. Pretest 2: Stating Functions - State a verb that describes the function of a specific noun. Subtest A: Associations - Name an additional item that is typically associated with a specific noun. Subtest B: Categorization - Name at least three items that belong to the specific category presented. Subtest C: Similarities - Compare two items and state the similar characteristics that place them in the same category. Subtest D: Differences - Contrast two items and state the differences between them. Subtest E: Multiple Meanings - State three definitions for each stimulus word. Subtest F: Attributes - Spontaneously describe a specific noun. The LPT-3:E was normed on a nationally representative sample of 1,313 children. The LPT-3:E can be administered in about 35 minutes and is easy to score. Raw scores are converted to standard scores, percentiles, and age equivalents, percentiles. The LPT-3:E is able to differentiate students with language disorders from neurotypical students.